Not only were they colorful and eye-catching, but they were SHINY. And this particular Visio Guy happens to have a thing for shiny objects (evidently I was a raccoon in a former life…), so the challenge was made, the gauntlet thrown down. 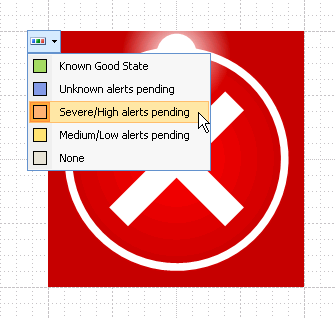 Could I create these icons in Visio? Well, I’m happy to say that the answer is “Yes”. 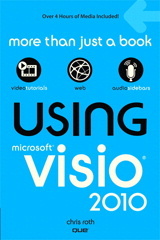 In fact, the screenshot that you see above was taken using instances of the resulting Visio SmartShape. Saveen was writing an amusing article about the tray icons for Microsoft Forefront Client Security not being up-to-snuff. You can read the post here: Why does the Forefront Client Security icon look so ugly? But I was just interested in the graphics, and the fact that they relate to a Microsoft product that readers of Visio Guy might just happen to be using. So we’ve created a Visio file for your downloading pleasure that contains a Master shape that can be configured to any of the four Forefront security states, plus a fifth “None” state. 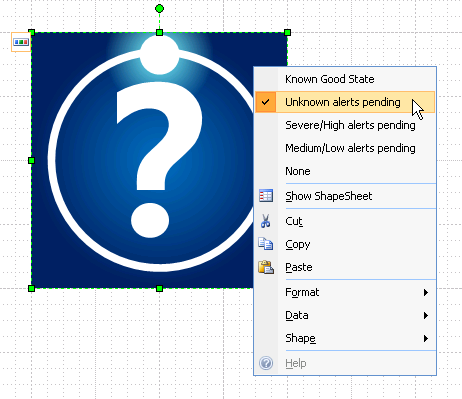 The document also contains a Data Graphic that links the icons to a Shape Data field so that you can really spruce up your Visio 2007 network diagrams! If you look in the Document Stencil of the download file, you’ll see a master named: Forefront States. We’ve built a triple-interface into this baby, so you can alter it’s look in any one of three ways. Yup, the first five Action rows are for the right-click menu and the second five rows are for the Smart Tag. Each set of five rows is very similar, except that the last five have TagName = “states”. This matches TagName value in the Smart Tag row, and tells Visio that these Action items should be displayed in the Smart Tag menu, not in the right-click menu. The Smart Tag rows also have some nifty ButtonFace values that spruce things up a bit. Have a look for yourself, experiment, and enjoy! If you look in the Document Stencil of the diagram (menu: File > Shapes > Show Document Stencil) you’ll see a master called: PC . 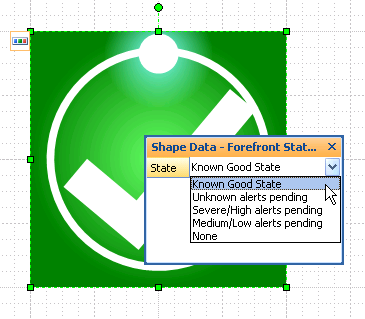 This shape has been modified so that it contains the Forefront State Shape Data field. We used the SortKey cell in the ShapeSheet to move it to the top of the list, as you can see below. The PC master also has a special Data Graphic applied to it that shows the Forefront states. This Data Graphic was built using a slimmed-down version of the multi-shape we’ve already described. The ForeFront Icons shape is a Data Graphic element called an Icon Set. It is used as part of a Data Graphic. The Forefront Icon Data Graphic contains this icon set, along with the specified values for each state – ie: which value causes which icon to display. 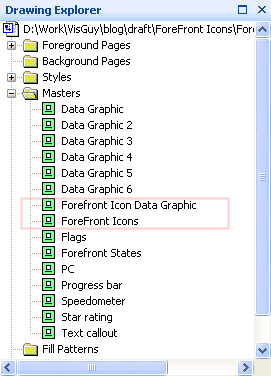 The Data Graphic also specifies that the Forefront icons should react to the value of the Forefront State Shape Data field, which the PC master contains. Oh, and if you’re interested in developing your own Data Graphics, have look at the article Data Graphics Resources for more information! I was trying to add my own icon to a shape and found this page. I am extremely impressed. You always have good infomation on your site. I and I am sure the community here appreciates it very much. Hi I was wondering if I can hide the data graphic text, data bar, icons, etc. (what ever the graphic image is) if there is no data for that shape and still keep the data graphic for the shapes that do have data? How would i go about doing this? Thanks for any help. Josie- have you found a solution? Im looking for a way to do this as well.